حسن زاده, مهرنوش, سلطان زاده, حسین. (1396). تدوین مدل مفهومی تحقق پایداری بافت‌های تاریخی با رویکرد راهبردی برنامه‌ریزی بازآفرینی. ماهنامه علمی پژوهشی باغ نظر, 14(56), 57-70. مهرنوش حسن زاده; حسین سلطان زاده. "تدوین مدل مفهومی تحقق پایداری بافت‌های تاریخی با رویکرد راهبردی برنامه‌ریزی بازآفرینی". ماهنامه علمی پژوهشی باغ نظر, 14, 56, 1396, 57-70. حسن زاده, مهرنوش, سلطان زاده, حسین. (1396). 'تدوین مدل مفهومی تحقق پایداری بافت‌های تاریخی با رویکرد راهبردی برنامه‌ریزی بازآفرینی', ماهنامه علمی پژوهشی باغ نظر, 14(56), pp. 57-70. حسن زاده, مهرنوش, سلطان زاده, حسین. تدوین مدل مفهومی تحقق پایداری بافت‌های تاریخی با رویکرد راهبردی برنامه‌ریزی بازآفرینی. 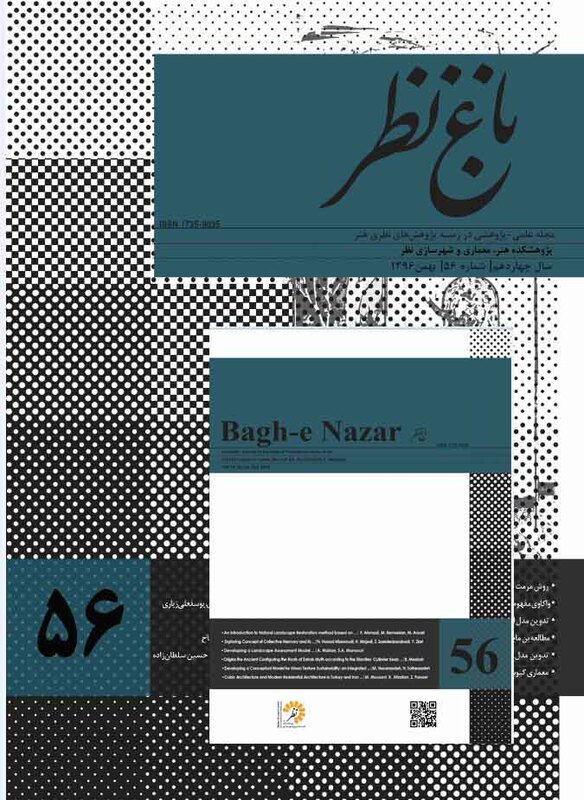 ماهنامه علمی پژوهشی باغ نظر, 1396; 14(56): 57-70. 1دکتری شهرسازی، گروه شهرسازی، دانشکده معماری و شهرسازی، واحد قزوین، دانشگاه آزاد اسلامی، قزوین، ایران. 2دانشیار دانشکده معماری و شهرسازی، دانشگاه آزاد اسلامی، واحد تهران مرکزی، گروه معماری، تهران، ایران. بافت‌های تاریخی به‌واسطه ویژگی‌های باارزش خود از سایر بافت‌های شهری متمایز هستند؛ اما اغلب به دلیل عدم انطباق با سرعت تغییر نیازهای ساکنین وارد فرایند «فرسودگی» می‌شوند. همین امر لزوم برنامه‌ریزی و حفاظت را در بافت‌های تاریخی تائید می‌کند. سؤال مطرح در این پژوهش آن است که چگونه می‌توان رویکردی مناسب برای مداخله هدفمند و تحقق پایداری در بافت‌های تاریخی اتخاذ نمود؟ پاسخ به این پرسش دو مرحله دارد: نخست آنچه بافت تاریخی باید باشد تا آن را «پایدار» دانست و دوم، فرایندی که برای رسیدن به پایداری باید اتخاذ شود. فرضیه این پژوهش عبارت است از استفاده از رویکرد راهبردی در برنامه‌ریزی بازآفرینی می‌تواند پایداری بافت‌های تاریخی را تحقق بخشد. بر همین اساس چارچوب مفهومی از نحوه مداخله در شرایط مختلف تدوین گردیده است. این پژوهش با رویکرد کیفی و با استفاده از روش تحلیل محتوا مورد بررسی قرارگرفته است. مطالعات مستخرج از نظریات مرتبط نشان می‌دهد محتوای پایداری بافت‌های تاریخی در ابعاد کالبدی، عملکردی، اقتصادی و اجتماعی بر معیارهای کلی منظرسازی، حفاظت، کیفیت محیطی، ثبات و سرزندگی اقتصادی، کیفیت زندگی و انسجام اجتماعی استوار است. همچنین فرایند مداخله در بافت برای نیل به محتوای پایدار بر‌اساس رویکرد راهبردی به ارایه مدل پیشنهادی انجامیده است که بررسی‌ها نتایج نشان می‌دهد پنج حالت برای مداخله در بافت تاریخی وجود دارد: وجود شرایط کالبدی ناپایدار، پایداری نسبی کالبدی و اقتصادی، پایداری نسبی کالبدی و اجتماعی، پایداری کالبدی و ناپایداری در ابعاد اقتصادی-اجتماعی، و وضعیت کاملاً ناپایدار در تمام مختلف. هر یک از وضعیت‌های فوق بر‌اساس فرایند برنامه‌ریزی بازآفرینی به راهبردهای مختلفی نیازمند هستند که به آن‌ها پرداخته شده است. The historical urban tissues are the rich sources of social culture history; so need to be revitalized because of "obsolescence" process during the ages and it is quiet natural. Rather than the characteristics of the historical tissue must be updated to meet the contemporary human needs by "integrated revitalization". This method known as a staged process which followed planned mechanism. Beside of all of this integrated revitalization based on maintaining natural capital for present and future generation which is known as "Sustainability". The main aim of this paper is to propose a model for integrating the two concept of sustainability and revitalization of historic urban quarters and to indicate an appropriate strategy for their revitalization. Based on this aim, this study use analytical-descriptive method according to documents and theoretical framework. So this study is based on several stages: ﬁrst presents the theoretical review on the concept of "revitalization", and its relationship with sustainability; next, it introduces the characteristics, role, selection process and scaling method of sustainability in compare with revitalization. The paper then, as the main contribution of this paper, proposes the model for measuring the level of sustainability in historic urban quarters and determines some proposals to achieve revitalized and sustainable historic urban quarters. Therefore, when the level of sustainability is high in any one of these three structures, it means that the level of obsolescence is low in the same structures of an historic urban quarter. The result of this paper leads us to say that, the level of sustainability is a new (additional) input in the strategic planning process of revitalization and sustainable urban revitalization of historic urban quarters. Finally, the paper concludes with a brief summary on the general arguments of the paper. As aforementioned, there are three strategic approaches in the revitalization process. Accordingly, there will be three proposals according to the level and types of obsolescence, sustainability and development dynamics in order to achieve more sustainable historic urban quarters. The ﬁrst strategic approach is determined by whether the area has a high resource value with physical obsolescence, high development dynamics and a high sustainability level. The possibility of high development dynamics, which are accepted as an historic urban quarter is still an attractive proposition for its current use and/or for alternative uses. In respect of these results, an historic urban quarter, where physical obsolescence and high development dynamics is present, it is necessary to implement physical revitalization as a short-term strategy and functional regeneration as a long-term strategy. In the second proposal, the strategic approach is applied when an historic urban quarter has only a partially sustainable position due to the presence of physical and functional obsolescence in the physical structures and problems in the socio-economic structure. If an historic urban quarter has physical and functional obsolescence, the development dynamics are in a static state. According to these results, the proposal should be to implement physical revitalization as a short-term strategy and functional diversiﬁcation as a long-term economic revitalization strategy to increase the attractiveness and sustainability level of historic urban quarters. The third proposal is applied when an historic urban quarter is in an unsustainable condition and demonstrates a high degree of physical, functional and locational obsolescence. If an historic urban quarter has these three types of obsolescence, the development dynamics are in a declining and/or deteriorating state. الکساندر، کریستوفر. 1381. معماری و راز جاودانگی : راه بی‌زمان ساختن. ت : مهرداد قیومی بیدهندی. تهران : انتشارات دانشگاه شهید بهشتی. امین‌زاده، بهناز. 1383. معضلات افزایش تراکم در بافت‌های فرسوده شهری. مجموعه مقالات اولین سمینار ساخت‌وساز در پایتخت. تهران : سابقون. پوراحمد، احمد.، حبیبی، کیومرث و کشاورز، مهناز. 1389. سیر تحول مفهوم بازآفرینی شهری به‌عنوان رویکردی نو در بافت‌های فرسوده شهری، فصلنامه مطالعات شهر ایرانی اسلامی، (1): 92-73. پورسراجیان، محمود. 1394. ارزش‌های محله تاریخی و معیارهای تغییر در آن از نظر ساکنین. مجله باغ نظر، (35): 52-39. حبیبی، سید محسن و مقصودی، ملیحه. 1386. مرمت شهری. چاپ سوم. تهران : انتشارات دانشگاه تهران. حناچی، پیروز، فدایی‌نژاد، سمیه. تدوین چارچوب مفهومی حفاظت و بازآفرینی یکپارچه در بافت‌های فرهنگی-تاریخی. نشریه هنرهای زیبا، (46): 26-15. گل، یان. 1387. زندگی در فضای میان ساختمان‌ها. ت : شیما شصتی. تهران : سازمان انتشارات جهاد دانشگاهی. زنگی‌آبادی، علی.، علیزاده، جابر و رنجبرنیا، بهزاد. 1391. برنامه‌ریزی راهبردی برای سامان‌دهی بازارهای سنتی ایران. فصلنامه مطالعات شهر ایرانی-اسلامی، (7): 26-13. Ashworth, G. J. & Tunbridge, J. E. )1990(. The tourist-historic city. London: Belhaven. Ashworth, G. J. (1991). Can places be sold for tourism? In Marketing tourism places, G. J. Ashworth and B. Goodall (eds). London: Routledge. Ashworth, G. J. & Larkham, P. J. (1994). A heritage for Europe: The need, the task, the contribution. In Building a new heritage: Tourism, culture and identity, G. J. Ashworth and P. J. Larkham, eds. London: Routledge. American Planning Association. (2006). Plans and Plan Making. NewYork: Routledge. Bianchini, F. & Parkinson, M. (1993). Cultural Policy and Urban Regeneration: The Western European Experience. Manchester: Manchester University Press. Conzen, Michael R. G. (1966). Historical townscapes in Britain: A problem in applied geography. In Northern geographical essays in honor of G. H. J. Daysh, J. House (ed). Newcastle upon Tyne, UK: Oriel. Dasgupta, P., (1993). An Inquiry into Well-Being and Destitution. Oxford: Clarendon Press. Davidson, K. M., Kellett, J., Wilson, L. & Pullen, S. (2011). Assessing urban sustainability from a social democratic perspective: a thematic approach, Local Environment. The International Journal of Justice and Sustainability,17 (1): 57-73. Doratli, N. & Onal, S. (2000). Urban design strategies in historic environments: evaluation of nicosia arab ahmed quarter revitalization project from a strategic planning approach, First International Urban Design Week, 2000, Istanbul: Turky. Doratli, N. (2000). A model for conservation and revitalization of historic urban quarters in Northern Cyprus, Unpublished Ph. D thesis. Eastern Mediterranean University. Doratli, N., Hoskara, S. O. & Fasli, M. (2004). An analytical methodology for revitalization strategies in historic urban quarters: A case study of the walled city of Nicosia. North Cyprus, Cities, 21(4): 329–348. Doratli, N. (2005). Revitalizing historic urban quarters: A model for determining the most relevant strategic approach. European Planning Studies, 13 (5): 749–772. Doratli, N., Hos¸kara, O.S., Oktay, B. & Fasli, M. (2007). Revitalizing a declining historic urban quarters The walled city of Famagusta, North Cyprus. Journal of Architectural and Planning Research, 24(1): 65–88. Dresner, S. (2002). The principles of sustainability. London: Earthscan. English Heritage. (2008). Conservation Prin ciples: Policies and Guidance for the Sustainable Management of The Historic Environment. London: English Heritage. Jokilehto, J. (1999). A history of architectural conservation. Oxford, UK: Butterworth-Heinemann. Stubbs, M (2004). Heritage-sustainability: developing a methodology for the sustainable appraisal of the historic environment, Planning Practice & Research, 19 (3): 285-305. Lichﬁeld, N. (1988) Economics in Urban Conservation. Cambridge: Cambridge University Press. Oc, T., Tiesdell, S. & Heath, T. (2007). Design in historic environments, in: S. O. Gur (Ed.) Proceedings of Liven arch III: conceptualism In Architecture, 3rd International Congress—Livable Environments & Architecture, July 5–7, Turkey. OECD. (1997). Indicators for Urban Policies. Paris: OECD. Oktay, B. (2005). A model for measuring the level of sustainability of historic urban quarters: Comparative case studies of Kyrenia and Famagusta in North Cyprus, Ph. D. thesis. Famagusta, North Cyprus: Eastern Mediterranean University. Orbasli, A. (2000). Tourists in historic towns: Urban conservation and heritage management. London and New York: E & FN Spon. Pendlebury, J. (2005). The Modern Historic City: Evolving Ideas in Mid-20th-century Britain. Journal of Urban Design, 10 (2): 253-273. Pendlebury, J. (2009). Conservation in the age of consensus. London: Rutledge. McDonald, S., Naglis, M. & Vida, M. (2009). Urban Regeneration for Sustainable Communities: A Case Study. Baltic Journal on Sustainability, 15 (1): 49-59. Meadows, D., Randers, J. & Behrens, W.W. (1972). The limits to growth. NewYork: Universe Books. Nasser, N. (2003). Planning for Urban Heritage Places: Reconciling Conservation, Tourism, and Sustainable Development. Journal of Planning Literature, (17): 467-479. Pearce, D. (1989). Blueprint for a green economy. London: Earthscan. Roberts, P.W & Sykes, H. (2000). Urban Regeneration: A Hand Book. London: Sage. Salama, A. M. A. (2000). Cultural sustainability of historic cities: Notes on conservation projects in Old Cairo. In: IAPS-16, IAPS 2000 Conference, METROPOLIS 21st Century, Cities, Social Life, and Sustainable Development. Schouten, F. J. (1995). Heritage as historical reality. In Heritage, tourism and society, D. T. Herbert, (ed). London: Mansell. Stubbs, M. (2004). Heritage-sustainability: developing a methodology for the sustainable appraisal of the historic environment. Planning Practice & Research, 19 (3): 285-305. Tiesdell, S., Taner, O. & Tim, H. (1996). Revitalizing Historic Urban Quarters. London: Architectural Press. United Nations Conference on Human Settlements. (1996). Habitat II, World Assembly of Cities and Local Authorities, May 30–31, Istanbul. Vehbi, B. O. & Hoskara, S. Ö. (2009). A Model for Measuring the Sustainability Level of Historic Urban Quarters. European Planning Studies. Available from: www.tandfonline.com/doi/abs/10.1080/09654310902778201. W. Caves, R. (2005). Encyclopedia of the city. NewYork: Routledge. Wilsmore, S. (1994). The ethics of restoration- Is it wrong to restore buildings? Paper presented under the theme "Conservation Philosophy and Practice. November 14-18, at the Institute of Advanced Architectural Studies, University of York, UK.